Around the city and beyond. Travel and discovery. Culture and fun. 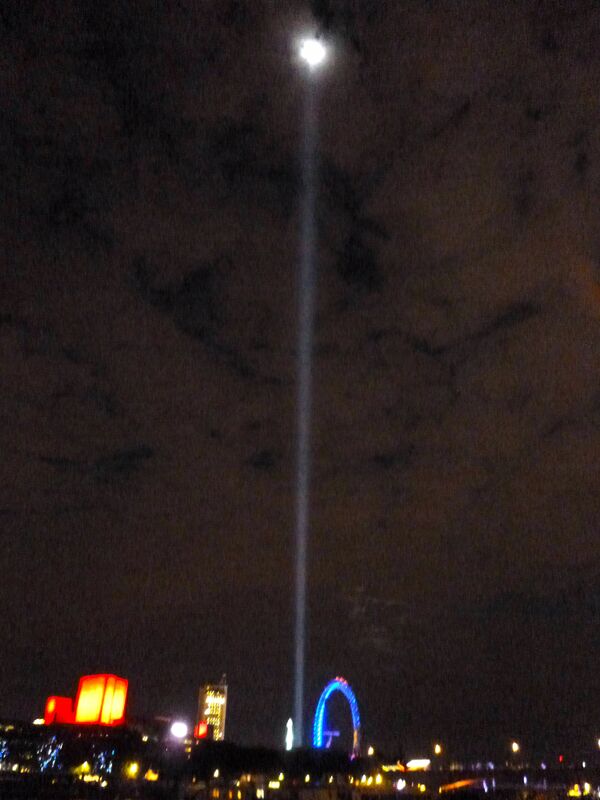 On Monday night London switched out lights all along the Thames—with one amazing exception. Streaming up into the sky from Victoria Tower Gardens, 49 huge spotlights sent glowing white columns soaring into infinity. 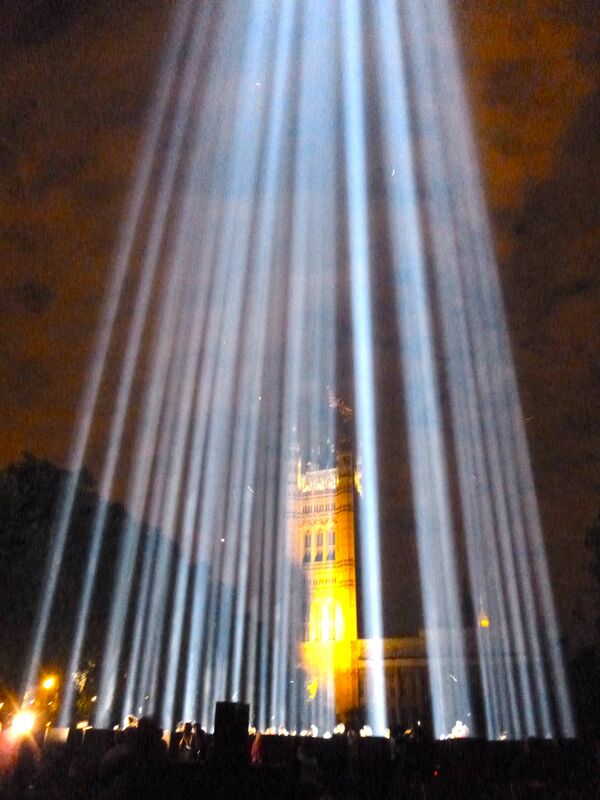 Spectra, an installation by Japanese artist Ryoji Ikeda, is visible from all over London. But the main experience is close up—so I headed towards the adjacent House of Lords. Spectra marks the centenary of the First World War; its beams stream up over the Union Flag fluttering on the House of Lords. Spectra is supported by Artangel, known for its strong track record of exciting events. The work launched to mark the centenary of the First World War. Approaching along the Thames, I first spotted it rocketing out Tate Modern’s chimney. 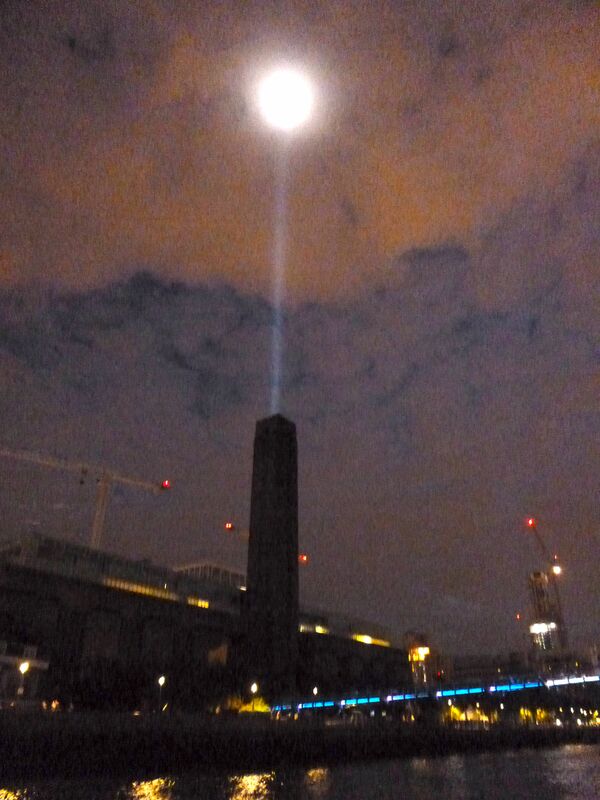 Spectra above Tate Modern and the Millennium Bridge. Then as I went upstream it appeared behind the National Theatre. The Southbank complex was glimmering blood red and scrolling on its illuminated sign Sir Edward Grey’s poignant words “The lamps are going out all over Europe, we shall not see them lit again in our lifetime”. Further on, spectra rose above the London Eye, three orange lights burning at its top, like a candle flame. Spectra shoots through the night sky like a wartime searchlight. Three orange lights atop the London Eye evoked a candle flame. Between 10 and 11pm the whole city switched off lights to remember the start of the First World War. The Houses of Parliament were barely discernible in the dark, apart from the clock face in Big Ben’s Elizabeth Tower, floating like a moon. Now I was close enough to see dazzling specks of light flitting through spectra’s beams: birds and insects which, like me, were being drawn in. A helicopter flew straight through, its rotating blades turned into a whirling silver plate. Entering Victoria Tower Gardens I roamed among the giant lights. Strange sounds—pings and hisses—emerged from speakers to add to the other-worldliness. Moths and butterflies hit the lights, sizzled and died. Just like all those young men who eagerly signed up to go and fight in the trenches a hundred years ago. I lay on my back and looked up through the trees. 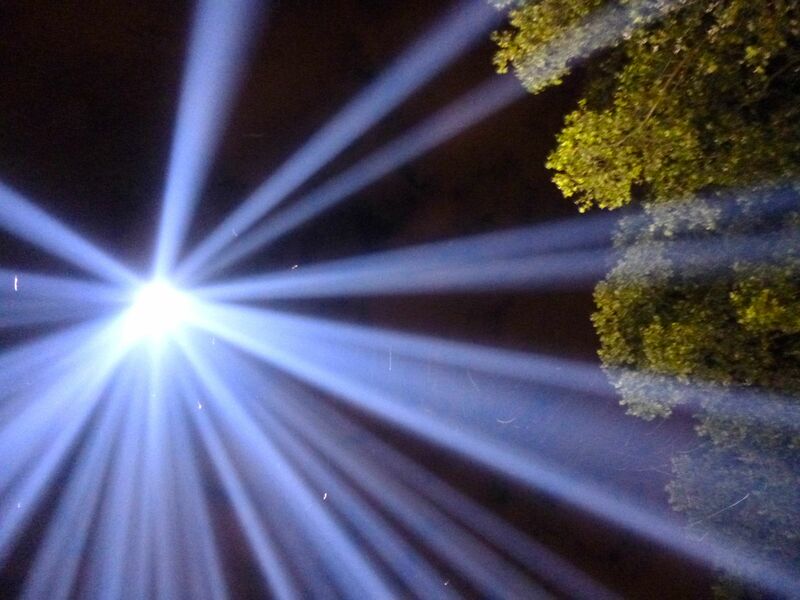 Spectra continues every night until sunrise on Monday 11 August. This entry was posted in ART + MUSEUMS, LONDON, Uncategorized and tagged art, artist, LONDON, ryoji ikeda, spectra, tate modern, World War One on August 6, 2014 by londonslant. Returning to the UK after living in India and China. Opening my eyes to the details of life back home.